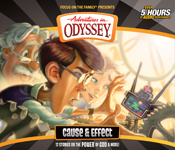 We own a half dozen or so (very early) Adventures in Odyssey albums, so I jumped at the chance to review the newest release from Adventures in Odyssey: Cause and Effect. I was reminded as we listened to this just why I love Adventures in Odyssey so much: it is something that we can ALL listen to without complaint. I enjoy it. My 13 year old loves analyzing each and every episode. My 9 and 11 year olds both love telling me what THEY would have done. My 4 and 6 year olds love to re-enact the stories later. At just under a half hour per episode, they are a perfect length too. As for this particular album, I think it was fantastic. Most of the episodes did center around the concept of actions have consequences -- something I've been working on in my home as of late. My favorite episodes on this album illustrate that. The Mystery of the Clock Tower (a two part episode) illustrates how one silly decision made as a child can have fairly serious consequences even twenty years later. My kids loved the mystery aspect, but the older three really got a lot out of the message too. An Agreeable Nanny was just wonderful. I'll risk spoiling the ending -- the kids have a "pushover" babysitter and they push, oh, do they push. This is after trying to convince their parents that they are old enough to take care of themselves. Everything goes from bad, to worse, to even worse. The whole thing was set up by the parents... they asked this babysitter to let the kids make all the decisions and go along with whatever. My older guys definitely got the point. Square One was great too. This one had to do with trust, and how when you have betrayed a confidence, it is tough to earn that trust back. My only disappointment in this episode is that Matthew learns this lesson quite well. But Emily, who betrayed Matthew, really didn't seem to grasp the lesson. Matthew was far too quick to forgive her. That sounds bad... as Christians we need to be forgiving and all. But the kids and I all thought Emily got off without much as far as consequences. This album also includes a Thanksgiving episode, a Christmas episode, and another half dozen besides. My kids have requested that we start listening to Adventures in Odyssey again... so I think I need to look into finding some more albums for Christmas gifts. Disclaimer: I received this CD set for free from Tyndale House Publishers. No other compensation was received. The fact that I received a complimentary product does not guarantee a favorable review.